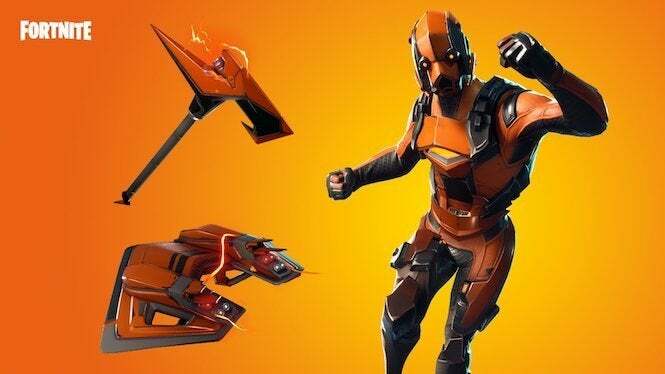 A couple of days ago, we reported a number of leaked items for Epic Games’ Fortnite, including some curious outfits like the Vertex, an orange battle suit that looks like something out of Justice League. Now there’s news that it’s a reality. Time to dress up orange and go nuts! Per this tweet from Fortnite Intel, the latest item shop update reveals that the Vertex outfit is a reality and can now be purchased for your character. Not only that, but there’s some other great gear that you can add to your collection. We’re not sure how long these items will last, so you might want to snap them up while you can. You can get a glimpse of these items from the tweet below. While the Vertex outfit appears to hide your face completely, it looks like very intimidating gear with its heroic styling. Pair it up with the Razor Edge Harvesting Tool and the Forerunner Glider and you’ve got a package that will make you look like you mean business. Even if you’re orange. Sure. Hopefully we’ll see some of the other leaked outfits found earlier in the week pop up in the shop over the weekend. The detective get-up looks pretty sweet, but the black Catwoman-style armor looks amazing as well. And of course you can't go wrong with all-American teddy bear, which is likely to be introduced next week as part of the Fourth of July celebration. As always, we'll let you know if any of these drop into the shop for purchase! Fortnite is available now for Xbox One, PlayStation 4, mobile and PC. It also recently released for Nintendo Switch as well, where it’s doing phenomenal business.